Hostinger Web Host is known for its quality but cheap web hosting service for beginner’s websites developers and webmasters who are professionals and wants to run the personal or business website online over the internet. So just in case, if you're looking for any cheap WordPress hosting, Magento hosting, Joomla hosting, Drupal hosting, OpenCart hosting, Prestashop hosting, or Forum hosting service provider, then you can consider Hostinger if your budget is tight and you want quality web host with best customer support service. 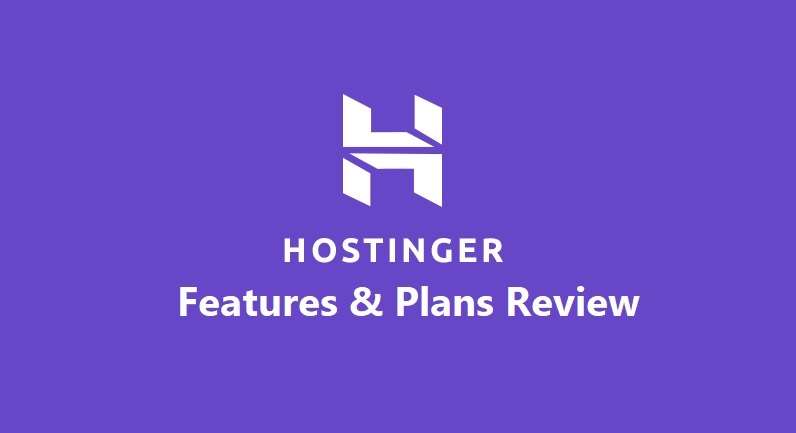 Today, we will discuss and review Hostinger Features and Plans in detailed to better understand what makes it different from other Web Hosting Providers. According to Hostinger Plans, they are committed to providing high-quality web hosting plans in cheap price to its users with premium web hosting features which are unlimited and dedicated live customer support. Currently, they are offering three affordable and inexpensive web hosting plans for websites and blogs i.e. Single Web Hosting, Premium Web Hosting, and Business Web Hosting. Just check these plans out and find out that Hostinger offers it’s services with free domains, unlimited bandwidth, unlimited storage disk SSD, unlimited MySQL database, unlimited email accounts, unlimited FTP users, daily backup data and many other premium features and functions. These features depend on the hosting package you chose. Hostinger Single Web Hosting Plan starts with the cheap price of $2.15/month after 47% discount. 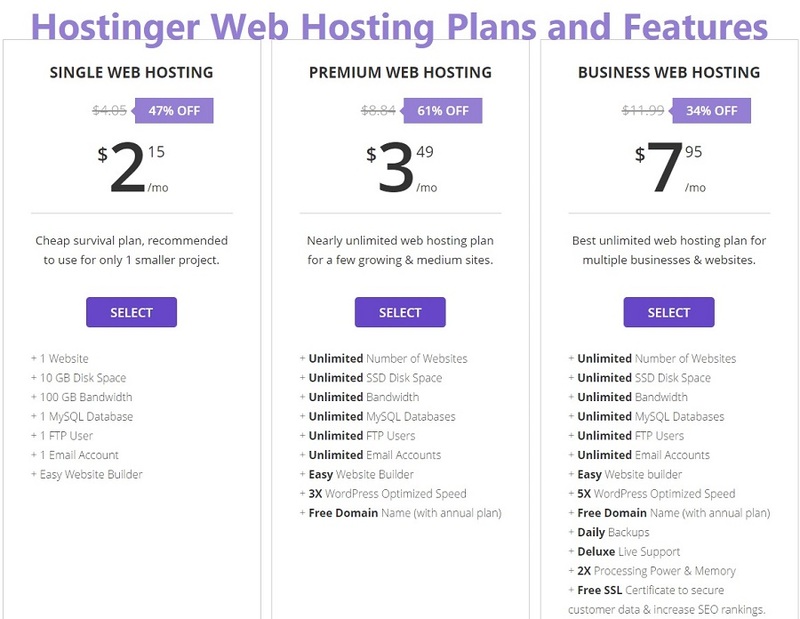 Hostinger Premium Web Hosting Plan starts with the cheap price of $3.49/month after 61% discount. Hostinger Business Web Hosting Plan starts with the cheap price of $7.95/month after 34$% discount. These are all current pricing as of writing this article. They may change low to high in future without any alert. These all Web Hosting Plans come with 30-days risk-free trial program, which means users of Hostinger are fully protected, and they can cancel their plans anytime without giving any reason. All users will get instant money refund within 30-days of plan subscription cancellation. Hostinger is offering its web hosting services to many popular business websites and blogs. They have a partnership with such well-known companies as Forbes, Medium, TechRadar, HuffPost, Bloomberg, TrustPilot, and many others. Moreover, Hostinger has 29,000,000+ clients from all over the world, and all of them are happy customers. The best thing about Hostinger is easy to build a website by using free website builder tool. Regarding the plan, you can get free domains with free SSL security certificates, instant 24/7 live support via chat and email, 99.99% uptime guaranteed, fast speed web host servers, VPS web hosting, latest use of technologies etc. So what's more you need for your business website and blog? Stop thinking now, and start getting your potential visitors, customers, and clients from your personal or professional website with Hostinger.com.